Today is Wednesday April 6 and it looks to be a cloudy day with a chance of rain in the afternoon. We seldom have a totally rainy day. More often we have totally sunny days. But the vast majority of days have both clouds and sun, and that can change for hour to hour. This morning we got a late start on things. All the activity yesterday made us very tired so we slept in today. Sandy didn’t go to the boulangerie today. Pretty much an American breakfast today, coffee, cranberry juice, cereal with strawberries, yogurt, and a bit of yesterday’s bread. Still a pretty nice start to the day. 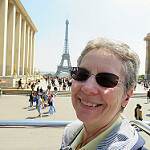 And, we ate in the dining room / salle à mange with the curtains open and a view of the activities on our street. After breakfast we took a walk to drop off the garbage and recycling. In the Intra-Muros we don’t have garbage pick up. The city has placed large recycling containers and large garbage containers at 5 or 6 collections spots throughout the Intra-Muros. It is the responsibility of each household and business to take their garbage and recycling to one of the collection spots. The garbage container is about 15 feet long, 6 feet wide and 6 feet high. There are two buttons of the container and a door. One button opens the door, you then place your garbage into the container, close the door and then press the other button. The other button starts the compactor which is part of the container. So your garbage gets compacted. Every week or so the city switches out the fuller containers for empty containers and the process continues. The recycling containers are smaller, 5 feet square and about 6 feet high. At each collection spot there is a recycling container for glass and another container for everything else which can be recycled; paper, plastic, cans, etc. These also are switched out every week or so like the garbage containers. It all seems to work pretty well. Outside of the Intra-Muros, the residents have garbage and recycling collection which is very similar to the collection process in the USA. After disposing of the garbage and recycling, we walked out to the harbor. It was too brisk to stay out long. We reentered the Intra-Muros and walked to the butcher. We were 5th in line. We purchased 2 sausages and some shredded Carottes Rapées (grated carrot salad) for dinner tonight. Then we walked to the tabac/presse to buy a newspaper and a few postcards. Sandy went to the Macaron Simon boulangerie and patisserie to purchase a baguette. Then we headed back to the apartment. Just before lunch our package from IKEA France was delivered. Sandy had ordered some new duvets and duvet covers. The last ones we purchased were also from IKEA so we felt confident in ordering again from them. After lunch Sandy worked on her homework for class tomorrow. The exercises are very worthwhile and reinforce the lessons we learn with our tutor Christine. Phil had homework too, research the origins of the “croissant.” There is some information on the origins of the croissant on the internet. Most of the stories agree that it was first created in central Europe, either in Vienna or Budapest. Apparently in the 17th century the town, either Vienna or Budapest, was under attack from Turks. The Turks were digging tunnels under the city for an attack. A baker was working late into the night and heard the digging. He alerted the authorities who repulsed the Turks. For his heroism the baker was allowed sole rights to bake the croissant. Apparently he fashioned the croissant in the form of a crescent which is the symbol of Islam and was used by the Turks. For more information click on this link to see what Wikipedia has to say on the subject of croissants. Late in the afternoon we took a walk to the post office / la poste in the Intra-Muros and mailed a letter to the USA. We walked around the streets of the Intra-Muros. It had become colder and more windy so we stayed off the ramparts. We walked to Saint-Vincent gate and then to the basin. We followed the basin around to the harbor. In the harbor a few boats were queuing up to enter the lock / ecluse so they could tie up in the basin. A couple of nice sailing ships were in the group, along with 4 or 5 fishing boats. Also in the harbor, the Corsaire Ferry was running. 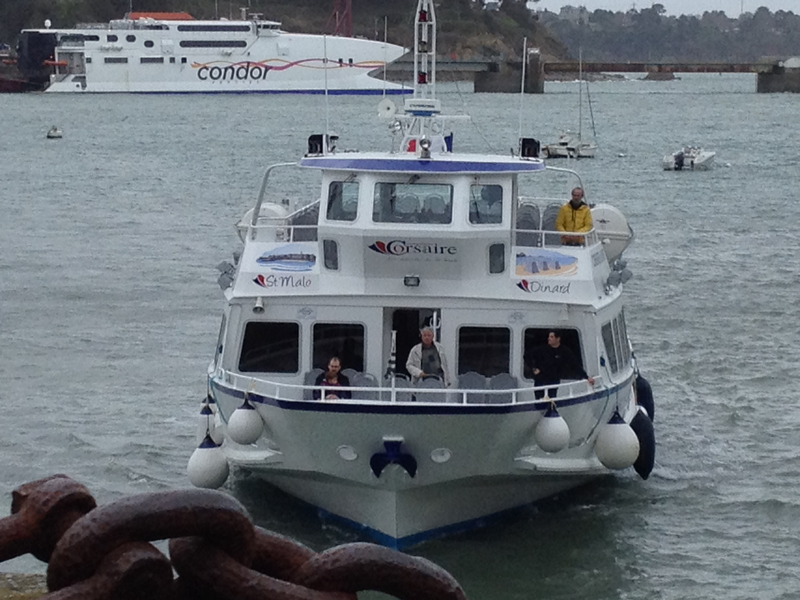 The ferry runs between Saint-Malo and Dinard. They also have tours around the area including many of the islands nearby. The boats are a lot of fun. 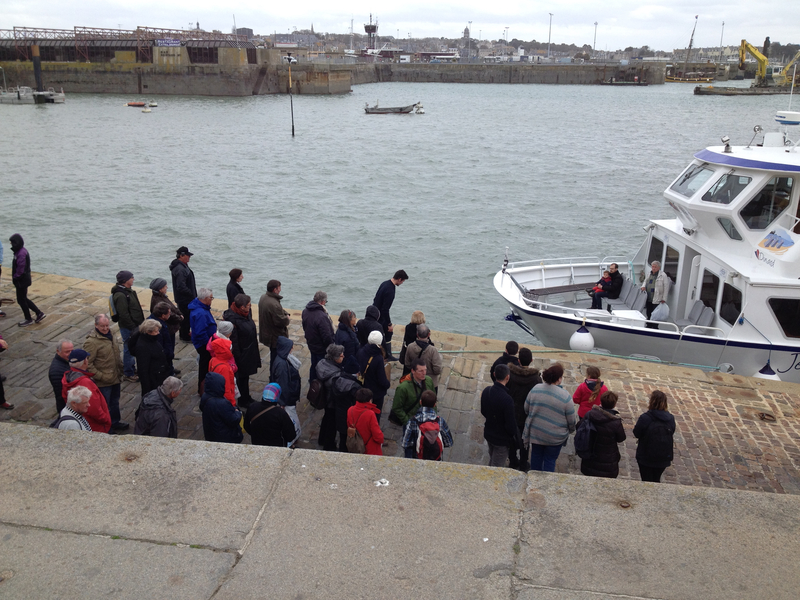 There were quite a few people queued up on the ramp down to the water, waiting for the ferry to arrive. For diner we had the sausages we bought today along with the carrots and potatoes Sandy bought on Tuesday morning. 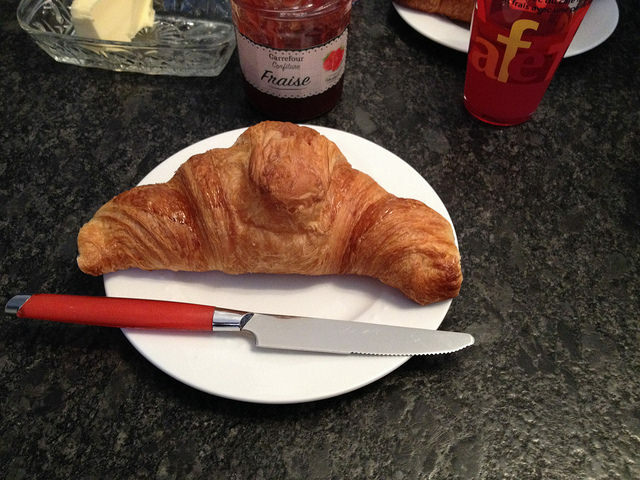 Croissants frais pour le petit déjeuner était le délice aujourd’hui! 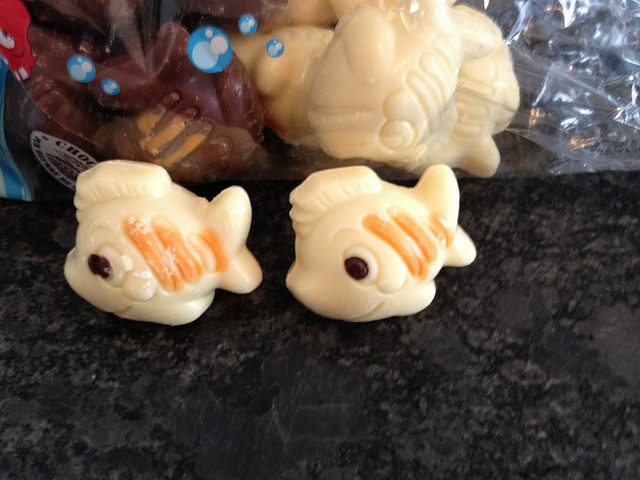 Nous avons attendu pour 2 articles pour finir notre nouvelle cuisine et c’était aujourd’hui le jour le concepteur devait leur apporter. Il est arrivé à temps et a la dernière poignée de tiroir. Il a installé sans aucun problème. Il a également apporté la boîte et le recyclage des déchets pour l’unité sous l’évier de la cuisine. Ils ne correspondaient pas! L’évier est très profond et maintenu l’unité de montage, si une unité de taille différente est en commande et devrait être ici dans deux semaines. Ugh! Au moins, il a été le concepteur qui ne pouvait pas faire les choses au travail, pas moi. Phil a travaillé plusieurs heures assembler l’armoire de stockage, nous avons acheté pour la salle de bains. Ce matin, c’était beau, ensoleillé et environ 17 C, mais cet après-midi, il a été plus frais avec une légère bruine. Ce soir, tout en préparant le repas, j’ai entendu un bruit terrible. Je pensais que notre four était vivante et habitée par des extraterrestres de son propre. 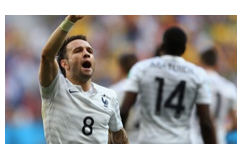 France venait de battre le Nigeria à la Coupe du monde et le bruit que j’ai entendu a été en provenance de l’extérieur! Quand j’ai regardé par la fenêtre de la cuisine, j’ai vu plusieurs personnes courir sur le trottoir portant des drapeaux français comme capes. Tout un spectacle! Fresh croissants for breakfast was the taste treat today! We have been waiting for 2 items to finish our new kitchen and today was the day the designer was scheduled to bring them. He arrived on time and brought the last drawer handle. He installed it without any problems. He also brought the garbage can and recycling unit for underneath the kitchen sink. They did not fit! The sink is very deep and kept the unit from fitting, so a different sized unit is on order and should be here in two weeks. Ugh!! At least it was the designer that couldn’t get things to work, not me. Phil worked several hours putting together the storage cabinet we purchased for the bathroom. This morning was beautiful, sunny and about 17 C but this afternoon it has been cooler with a light drizzle. Tonight while cooking dinner I heard an awful noise. I thought our oven was alive and inhabited by aliens from the peculiar sound. France had just beaten Nigeria in the World Cup and the noise I heard was coming from the outside! When I looked out the kitchen window I saw several people running down the sidewalk wearing French flags as capes. Quite a spectacle!